I've had a lot more time than usual these last few weeks, and of course I'm wasting it watching too much video. I stumbled upon Kim's Convenience on Netflix, having never heard of it. I'm supposing you haven't either, but in these times, it's something you ought not to miss. Every day we are bombarded with the atrocities committed by the lunatic in the White House. Every day we have to sit and wonder what new outrage our President will commit, what juvenile insults he will tweet from his phone, which vicious regime he will identify with, just which nazis are fine people, and who he will threaten war with on Twitter. In fairness, the President has a mandate by every standard (except votes cast). But I digress. In the real world, no one's really finding happiness or fulfillment Making America White Again. We have to find some more efficient way to get along with and understand each other. It's a particular struggle for immigrants, relentlessly targeted by the Bigot-in-Chief. I work with immigrants every day, and it's a tragedy that we are so close-minded. I like the Andy Griffith Show, but we don't live in Mayberry anymore, if indeed we ever did. Kim's Convenience is about a Korean-Canadian family running a convenience store in Toronto. Their friends and customers are from various cultures. No one is represented as perfect, and human flaws create character-driven comedy. It's important to see representation of real people, and I can't think offhand of an American show that does this remotely as well. Mr. Kim is kind of a smarter Archie Bunker. He's very quick-witted and generally free from stereotype. Nonetheless he can't forget things the Japanese did in 1910, and therefore rages against Toyotas. But his Pentax camera was half-price, so that's somehow not an issue. He struggles to deal with his children, one of whom, alas, studies photography rather than medicine. He's estranged from his son, who's dealing with his checkered past. The Kims are a family, imperfect like everyone. But they're also clever and funny, so your time with them is well-spent. I'm impressed to finally see fair representation of people with accents. There's so much prejudice against accents. I once knew a teacher who criticized a Cuban-born colleague of mine for her English. Her English was fine, actually. I found it really ironic that the guy criticizing her spoke one language while she spoke two. The irony escaped the critical teacher. There's a line from a great underrated film, A Walk in the Clouds, where Giancarlo Gianini says, "Don't think that just because I talk with an accent, that I think with an accent." Kim's Convenience will make fun of certain language-related errors, but never portrays its characters as being stupid simply because of how they speak. It's important that we see characters like that, and sad that we generally do not. 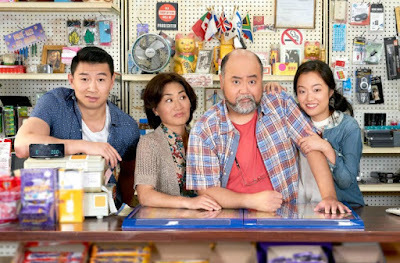 If watching Kim's Convenience is not the best way for you to see true multiculturalism, you could always do what I did and teach ESL for a few decades. I have to say, though, that with Race to the Top, junk science, and an anti-labor SCOTUS, you might get fewer laughs from teaching 20 years than you would from watching a sitcom for thirty minutes.